The final registration process is initiated by email. If you didn't receive an email from efgseattle.org, check your junk folder and/or contact registration@efgseattle.org. The email you received contains the steps of the registration. It also contains custom links that will point you to pre-filled forms (it will prevent to enter wrong student / guardian ID). It will help you complete the forms without having to re-enter the information you provided during the pre-registration process. Read documents. Nothing complex with this 1st process. As each year, we updated the EFGSeattle Enrollment Policies and Parent/Student Handbook and we invite you to read them. In step 3, you will sign the contract "Upon signature of this Contract, you agree to fully comply with our rules and our procedures, as described in those documents, so just follow the links to open the documents. If you have any questions, please contact info@efgseattle.org. Fill out the Volunteer & Communication Form. You will be asked your communication preference and choose if you both want to have all notifications (from EFGS admin, from the teacher, from the library... default option) or if only one of you needs / wants to be notify. Then you will be asked for your volunteer preferences. This year, we want to ask ALL families to volunteer in some way, shape or form. 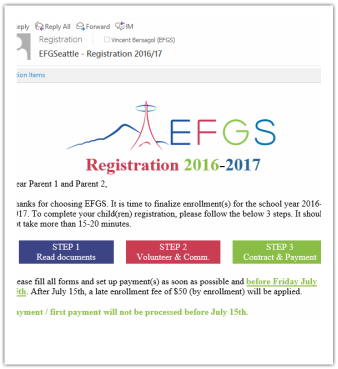 EFGS is an organization started and operated by parents for other parents. We are very thankful to all the volunteers, without whom our programs would not be possible. If you have any question about the volunteer program, please contact volunteer@efgseattle.org. Please, remember, 1 form for each parent. 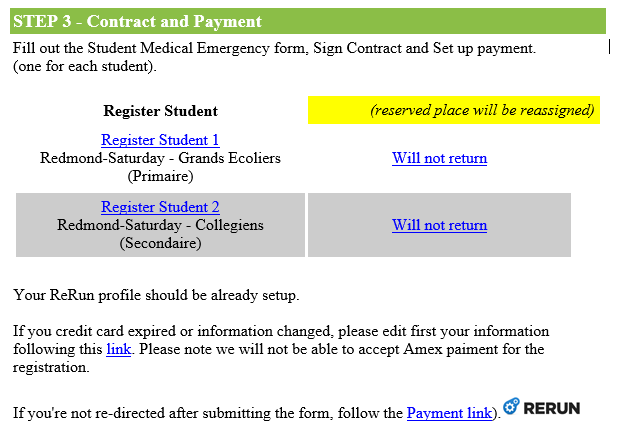 Fill out the Student Medical Emergency Form, Sign Contract, Set up payment form. We combined signing the contract, the student medical form and the link to the payment site in a single form. The form needs to be filled out for each student / kid. The emergency contacts and the medical information may be identical for each student, so you have the option to "copy" the information for the 2nd / 3rd student. The last page (8) of the form is the signature of the contract and choose your payment plan. For the payment system, we are using PayPal (but no account required). You will receive the 1st PayPal invoice by July 1st (or within a couple of days after your registration). To know more about it and understand all options, please click here. Finally, just verify your information. In case of error, just reply to the email and let us know the information to correct.